Dr. Arthur Budd | Launceston Then! Arthur Budd seen sat in his car outside the Kings Arms in 1909. Photo courtesy of Ray Boyd. 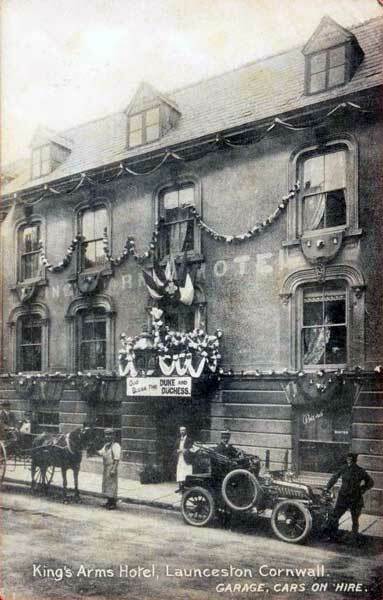 Arthur was born in 1880 William and Mary Budd at Southernhaye, Exeter. His father was a surgeon. Arthur followed into his father profession gaining a M.B. Bach. At Durham University in 1904. He stayed with Mrs. Burnfather at Jesmond, Newcastle-upon-tyne. He moved to take up the position of G.P. at Launceston’s Southgate surgery alongside Dr. W. Thompson and Dr. C. Gibson. With the outbreak of war he volunteered his services as a medic in August of 1815, and served with the R.A.M.C. acting as a Second Lieutenant, then Captain. He was slightly wounded whilst serving in Mesopotamia. “Just a few lines to let you know how things are going on. I daresay you may have heard that our ….Division were sent from the Gallipoli Peninsula Campaign to Mesopotamia as relieving Forces for the relief of General Townshend. We had a quiet but interesting time coming up the river Tigris, passing through many historical places of interest. It was very slow work coming up the first few hundreds of miles, for owing to the shallowness of the river the troops had to be brought up river in comparatively small steamers; then we drew into the bank of the river every night and encamped and did the cooking for the men’s food for the day. One night we camped in the original ‘Garden of Eden’; but there were no apples to be seen, however. Other nights we encamped at Sodom and another at Gomorrah. Beyond their Biblical interest I have little to say, for they are about the most god-forsaken places you could imagine and mere deserts. Our real hard had commenced after we had travelled several hundreds of miles up the Tigris, and after heavy marching night and day we eventually reached the Front, where we relieved the ….Division for the final push to try and relieved Kut. We knew towards the end how many days more Townshend could hold out, which made things more exciting and at the time of the fall of Kut we were only eight miles away. We had some very stiff fighting the last few days and fought four battles in nine days. So you can imagine I was kept very busy. Unfortunately, this regiment lost pretty heavily in the last engagement, both in men and officers. After the war he returned to his original role at Launceston and continued as the Medical Officer for the Health Board. Arthur never married and he died in May 1937. 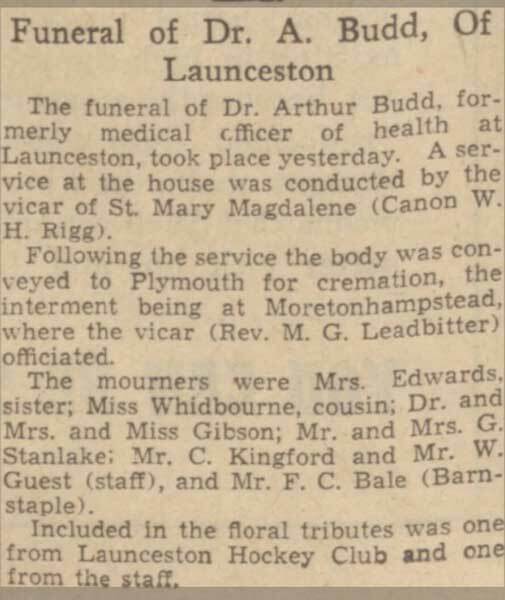 The funeral service was held at his home by the Canon W. H. Rigg followed by cremation at Plymouth and internment at Mortonhampstead.